This is one of just two cars in the world with this unique feature. Pagani built just 100 units of the Huayra coupe. Of these, just two units were slated for the UK as right-hand drive models. And now one half of this unique pair is up for sale with UK dealership Furlonger, based out of Kent. Priced at 1,849,990 GBP (or just under $2.4 million at today’s rates) and finished in Dubai Red with a Nero black interior, the 2013 MY Pagani Huayra was recently serviced by the Italian carmaker and looks like it just rolled off the production line in Bologna. It wears chassis number 007, and comes with a glut of optional extras including gloss-finish exposed carbon-fiber exterior elements, titanium-finish aluminum trim, silver-finish wheels, leather interior with red stitching, extra-large seats, and a six-piece luggage set. As with all Huayras, power comes from an AMG-built 6.0-liter twin-turbo V12 rated at 720 horsepower and 811 lb-ft of torque. It’s capable of going from 0-62 mph in 3.0 seconds and reach a top speed of 230 mph. 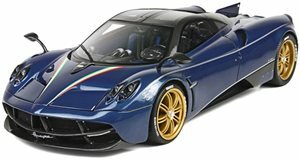 Pagani recently revealed the Huayra Roadster at the Geneva Motor Show, essentially a completely new model with almost every element different from its coupe counterpart. All 100 units of the drop-top slated for production are spoken for. Anyone looking to get hold of a brand-new Pagani will have to wait for the Huayra Roadster BC that Mr. Pagani himself told us in Geneva is currently in the works. But there’s every chance all of these are also already sold out. If you’re a millionaire living in the UK, then this Dubai Red Pagani Huayra is worth having a look at.